Description: This is an assortment of individually packed Original Little People set that was sold to retail stores for resale. 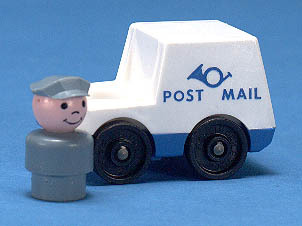 The assortment includes the following sets: Fire Engine, Police Car, Ambulance, and Mail Truck. 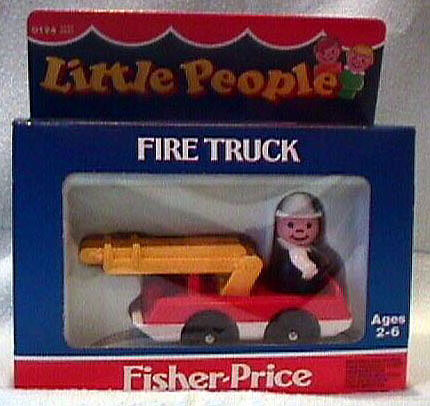 Each set includes a vehicle and a Little People figure. The Police car set was also sold with a street sign in later years. 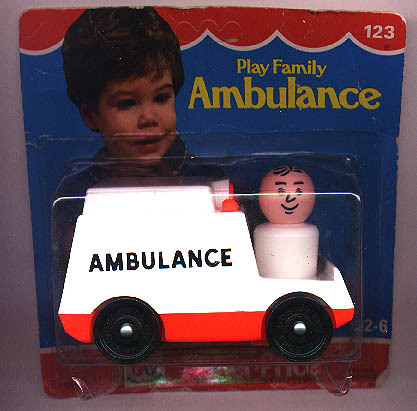 In 1978 only, all 4 of the above sets (#124-127) had #123 written on it's individual box, as shown in our provided photo (Ambulance). Thus, a mint on card set marked #123 on the packing is quite rare and more valuable than a mint on card set marked #124-#127. This assortment was replaced in 1985 with #2350 Little People Vehicles Assortment.